Pics and Kicks: Ireland VIctoria. Surviving on cell phone pictures from Grammie. . . This is my beautiful niece Ireland. and thereby hopefully stop dressing Lincoln up like girl . . .
How cute! What a beautiful name! Congrats Steph and Kev! WE LOVE OUR NEW NIECE! THE BOYS LOVE THEIR NEW COUSIN! I am not sure that I have heard of an Ireland before. I really like that name. Tell your sister good job on making a pretty baby with a beautiful name! Ireland is a family name on my Dad's side. Woot woot! 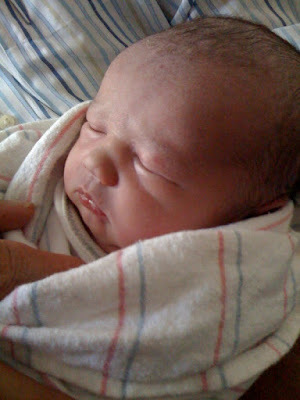 Congrats on the beautiful niece, Natalie! Ireland is sooooo beautiful!!! The sweet baby AND the name -- Oh -- I neeeed to go see her! SOON...Congratulations to you (Auntie), and Steph and Kevin! So happy for you!